Review: Another day, another international series added to the burgeoning library of overseas Netflix content. Today it’s Monkey Twins, a Thai martial arts drama created by Nonthakorn Thaweesuk that combines elements of old-fashioned crime thrillers, romance and absurdist comedy in a ropey package that shows its influences about as much as its budget. 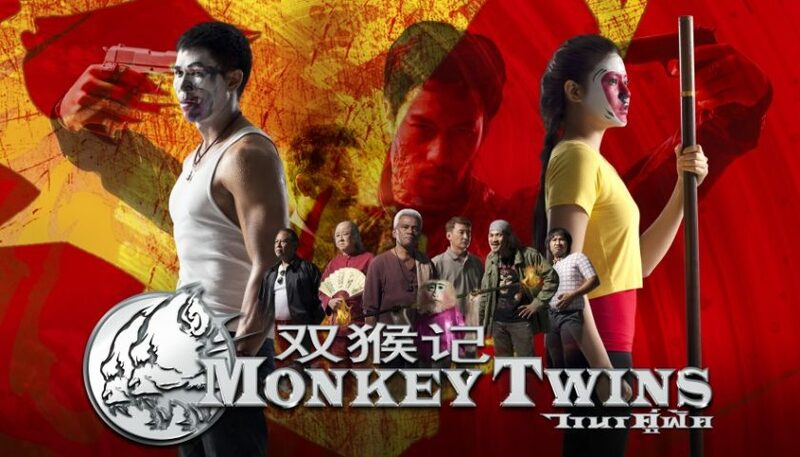 In Monkey Twins a cop teams up with an embittered martial artist to thwart a sinister crime ring, and stop me if any of this sounds familiar: Stripping to the waist to prove you’re not wearing a wire? Playing hardball with the local crime boss to show you need to see the drugs before you hand over the money? Being forced to kill a man to prove your loyalty, and delaying the execution for just long enough for the observing police team to bust in before you have to do the deed? This is second-hand crime drama through and through, just filtered through the slightly oddball traditions of Thai cinema. Those traditions include wacky comic relief that never coheres with the supposedly deathly-serious criminal underworld plot, and a soppy romantic through-line that isn’t entirely in-keeping with the rest of Monkey Twins either. The overall effect is a weird mishmash of influences, styles and themes that just feels vaguely confused and uncertain rather than diverse and interesting. But you’re here for the fights, I’m sure. And it brings me no pleasure to report that they’re not all that great either, although they do manage to evoke a few moments of inspiration, or at least some facile “That was pretty cool” enjoyment. But the semi-authentic Thai styling lacks the crunchy authenticity of, say, A Prayer Before Dawn, and has nothing like the stylized madness of the Ong Bak series, which I suppose represent the two extreme ends of on-screen Muay Thai. It’s an awkward middle-ground that is hampered further by extremely lacklustre production and a heavy reliance on dodgy-looking editing effects, including liberal slow motion that only serves to highlight how much these performers aren’t actually hitting one another. Things at least get more brutal as Monkey Twins progresses through its 13-episode season, but even at its bloodiest it’s still limp-wristed in comparison to its contemporaries. And don’t even get me started on the sound design, which renders some fights laughable with Super Mario-esque cartoon impacts, to say nothing of the unintentionally-hilarious pop-gun shootouts. There’s a decent show here, but it’s hiding beneath so much rubbish that it’s difficult to imagine what it might look like.